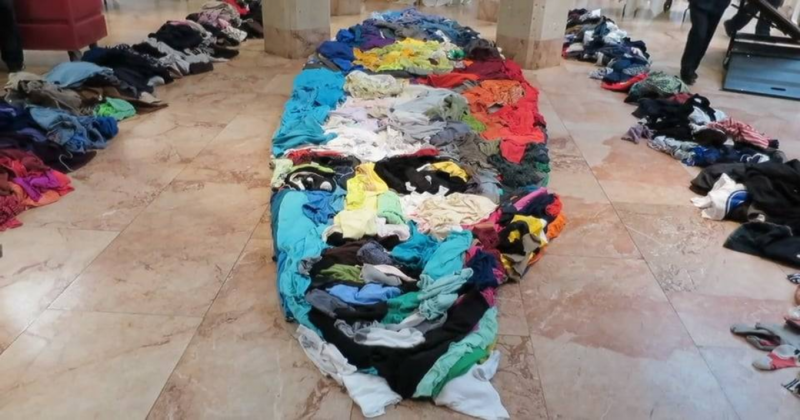 Genius Artist Creates A Huge Anamorphic Tribute Portrait Of A Famous Photographer Using Thrift Store Clothing. Born to enslaved parents in Prince Edward County, Virginia on August 10, 1854, James Conway Farley became the country’s first prominent African American photographer, winning awards for his work, as well as enduring the adversities and discrimination of the era. In a site-specific installation for Family Day at the Museum of Fine Arts in Richmond, Virginia, artist Noah Scalin used thrift store clothing to create a giant anamorphic portrait of James Conway Farley, a renowned African-American photographer in the 19th century. This artist created theportrait at the Virginia Museum of Fine Arts. The portrait was based on a photograph taken by Richmonder James Conway Farley, the first African American to achieve prominence in photography. Owner of the Jefferson Fine Arts Gallery by 1895, James Conway Farley had worked for decades to create beautiful photographs, much in demand by Richmond, Virginia clientele of all backgrounds. This portrait of his face is really a unique creation of art.